I would love to see your face in the audience at this reading. I am very pleased to be reading at the Descant 159: “A Winter’s Guide to Melancholia” Launch. In this issue, Descant will be featuring five of my poems: “I meant to tell you the sewing dream”, “Divorce is a black”, “The Cathedrals”, “Bacchus’ Wedding Gift To Me”, and “The Pomegranate’s Revenge”. 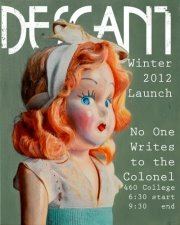 The launch will be at No One Writes to the Colonel located at 460 College St. in Toronto., from 6:30 pm – 9:30 pm. on January 23, 2013. Descant is telling you early, before you get a chance to be intoxicated for Christmas rush season, so no excuses! 2 tickets to “Salome” on May 22, 2013 from the Canadian Opera CompanyThis launch will also feature several contributors as readers, including Natalie Thompson, Daniel Karasik, Joshua Learn, Mark Lavorato and Bill Howell. Please come out and remember to invite friends and family! I will learn lots of new stuff right here!